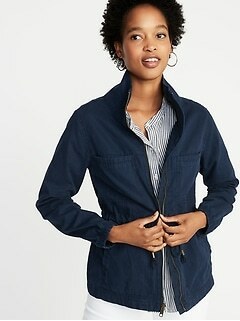 Create a classic casual look with military jackets from this amazing selection at Old Navy. 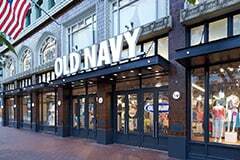 Browse military jackets from this fantastic selection at Old Navy and find the perfect design for your look. 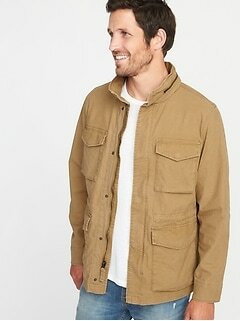 A field jacket is a highly adaptable garment that can fit with a variety of vibes. Brilliantly tailored to resemble an authentic army jacket while still having a slender and fashionable fit, you'll find these coats to be a go to outer layer on temperate to brisk days. From a summer night by the sea when a slight breeze picks up, to a late fall afternoon paired with a hoodie, an M65 jacket from this collection will play a huge role in your wardrobe for most of the year. 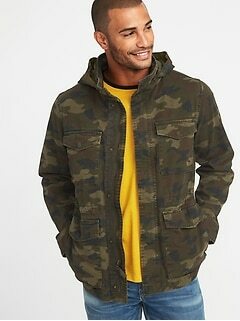 Military jackets from Old Navy will compliment many different styles. Pair them with a tight vintage graphic tee and skinny jeans for a hip look, perfect for men and women at casual social events, like concerts, happy hour, or a night at the drive-in. An army jacket over a white or light colored sundress with combat boots is a classic retro 90s outfit that channels a sort of playful grunge chic. 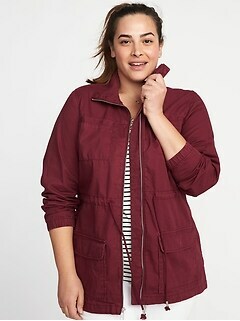 Whether you plan out a wardrobe around these jackets, or just take one along to throw over whatever you're wearing if it gets cold, you'll find them to work with pretty much any look. 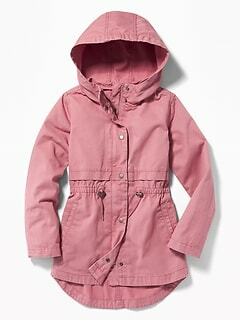 Army jackets from Old Navy are made tough, just like the real thing. You'll appreciate the soft feel of premium quality fabric and the fantastic fit of these brilliantly tailored field coats. Tailgate before the big game with friends and throw the football around the parking lot. Run through the woods with your secret crush and dive into that hidden pond. Pack onto a crowded subway with thousands of other commuters. These durable military jackets are up to the job. Look fashionable in these well-made army jackets, and be prepared for whatever the day may bring. Match classic style with your on personality and create a great outfit with military jackets from Old Navy.